Father to Legolas Greenleaf, Thranduil is a powerful Elf-Lord and a legendary fighter. King of the Woodland Realm, he rules over the northern lands of the great forest known as Mirkwood. 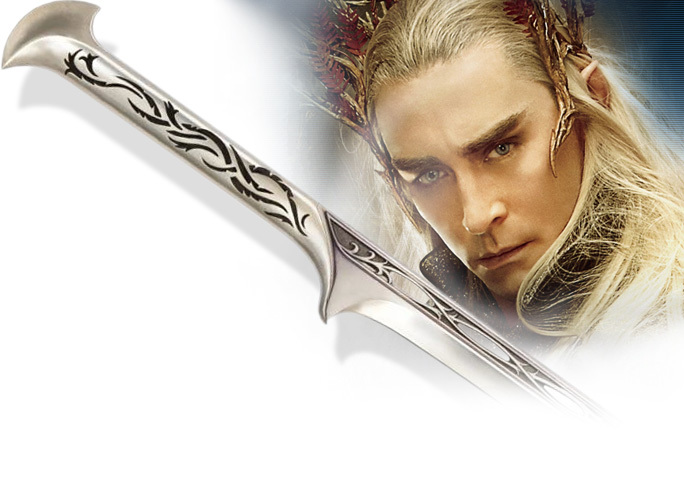 The sword of the Elvenking was one of two twin swords crafted for Thranduil by the finest smiths of the Woodland Realm. The blade and flowing hilt are forged with engraved vine and leaf symbols representing the forests of the Greenwood, all forged from a single piece of silver Elven steel. Thranduil’s sword is a supreme example of Elven craftsmanship and graceful utility melded with the symbolism of their deep forest home. This licensed replica of the Sword of Thranduil has been recreated from the movie prop seen in The Hobbit: The Battle of the Five Armies. It has a blade and hilt of stainless steel. 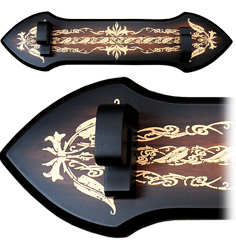 It comes with a wooden wall display featuring the fine vinework typical of elven art. Mounting hardware is included. A Certificate of Authenticity is also included. • Overall Length: 42 1/8"
• Blade Length: 31 1/4"